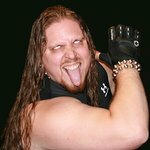 William “Brimstone” Kucmierowski (pro wrestler, actor, author, comic book hero, etc) donates his time and efforts to various charities including RADD (Rockers Actors and Athletes Against Drunk Driving), for which he is a spokesperson, Wrestler’s Rescue, American Cancer Society and the Ronald McDonald House Charities. He has attended events in support of the Arthritis Foundation, Parkinson’s Foundation, Toys for Tots, and was a special guest at Bikers for Babies, which benefits March Of Dimes. We don't have any videos related to Brimstone.